The last panel was put into the ground this morning. There is still a lot of work to be done, but getting up all of the ‘walls’ is substantial. For those who have purchase commemorative concrete, no worries, most of the pours are the bases and will be covered up, we’re only writing names in the top layers and there are still several of those to come. Next up, the guys will start building gates- 13 to be exact. While that happens, forms will also be made for the concrete patios and a front cement walkway for each stall. Because we use the patios for footwork and minor medical procedures (there is a different chute for intensive care- longer with taller bars) concrete is necessary for cleanliness. The front walkways are mostly for training- the girls don’t like picking their treats up out of the dirt (the stalls have natural dirt floors). The stalls of this barn were designed to be larger than the first barn, taking into account the additional space for the walkways. They will also allow for more consistent thermal imaging scans, since we have to achieve the same views on both sides of the body to be of diagnostic quality. 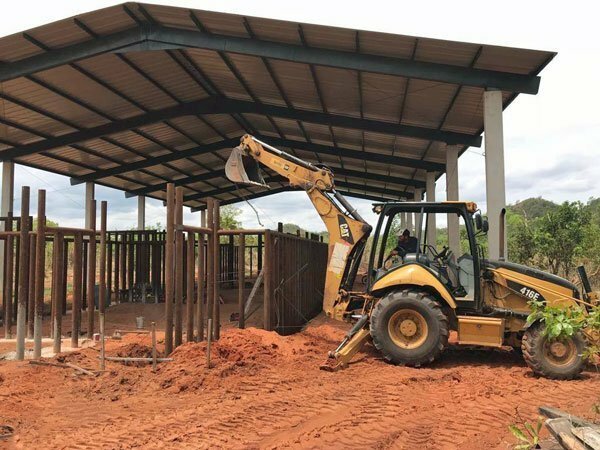 Lots to still be done, but this is a big step to getting Kenya’s home built. And even with all of this work and attention to details, our hope is that they don’t spend any time inside of the barns. A beautiful and safe home for the elephants!